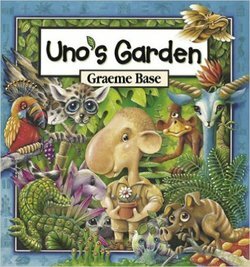 ​Uno's Garden is a picture book written and illustrated by Australian children's author Graeme Base. The story features themes of environmental degradation, conservation of nature and habitat, and extinction. It also features arithmetic, and at the back of the book there are instructions for several number games relating to the book. It also contains a game in the book where you have to find an amount of plants, animals, buildings and sometimes one snortelpig. All of the animals and plants featured in the book were invented by the author. Some of the animals included are the snortlepig, moopaloop, lumpybum, and frinklepod. The human voice of the story is that of the aptly named Uno, the first man to move into the forest. 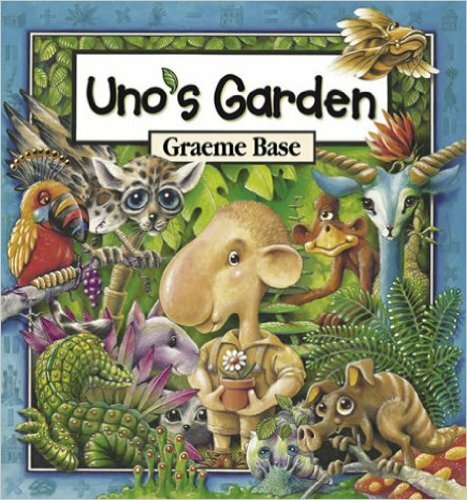 The story continues as other people follow Uno in moving into the forest, and as the number of people and buildings increase, the number of plants and animals decrease.